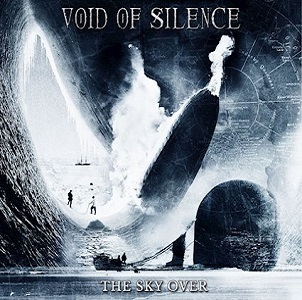 Italy’s Void of Silence has employed four different vocalists across five studio albums. This is a good way to ensure fans never get used to one dude holding down the mic, eh? Two of Void of Silence’s previous vocalists are notable: Aborym leader Malfeitor Fabban sung on the band’s first two studio forays; Primordial throat-a-glory A.A. Nemtheanga lent his unsurpassed pipes to 2004’s Human Antithesis. A Brit by the name of Brooke Johnson helmed the band’s most previous album, 2010’s The Grave Civilization, which brings us to the here and now: The Sky Over and new vocalist Luca Soi. It would be beneficial that we discussed the band’s sound, which is of the climatic, symphonic doom variety. Soi employs virtually entirely clean vocals, preventing Void of Silence from being sucked into the dreaded void of drab-on-doom and the like. He’s a good, but not remarkable singer, and we say in that within the context of who used to sing for Void of Silence. Plop him into one of the band’s trademark long-form, quasi-plodders like “The Void Beyond” and he can get a little monotonous. Actually, since there’s no such thing as a short, regular Void of Silence song (there are two interludes here, though), Soi is often left to try out new things as each song progresses, like on the title track, which aside from a steady diet of keyboards, builds and lunges in the way Arcturus would if they weren’t so avant-garde. The problem with writing such long and winding songs is that recall isn’t going to happen early and often. Void of Silence is apparently of the mind that they are a fully immersive listening experience. No problem with that. But if the Italians want to move up the epic doom chain, they’ll need to stick with a vocalist, and, learn from other bands how to make long-form doom appealing.